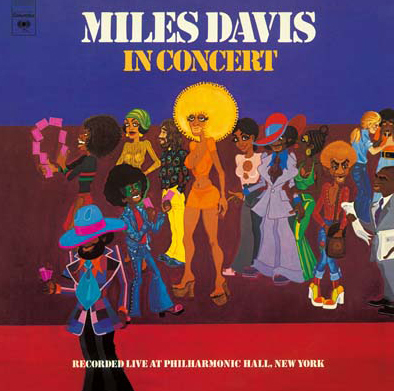 On September 29, 1972, Miles returned to Philharmonic Hall in New York to perform some music created in the studio since the early sessions for On The Corner, and several riffs from the period of Jack Johnson, which still remained in the repertoire. While it is clear that Carlos Garnett and Reggie Lucas were not the high-quality soloists Miles’ past performers were, his music was less involved with inviting solos than with dwelling in the rudimentary and powerful grooves created by the drums of Al Foster (who stayed loyal to Miles until 1984) and Michael Henderson’s bass. The trumpet itself—when not relentlessly returning to the brief refrain from “Black Satin” or the lamentations of “Ife”—abandoned the melodic ground. With the help of the wah-wah pedal, Miles shaped its sound as though it were some kind of abstract clay, moving closer to the most radical aspects of Jimi Hendrix’s guitar playing. Massively edited by Teo Macero, these tracks appeared in a double album the following year; they aroused perplexity, indeed hostility, in old admirers without, however, gaining any new fans.